Since my visit to Rowena on Tuesday, I've been unrolling the great big thought-ball that was downloaded into my head. Scrub jays woke me up with their screeching this morning. I went back to sleep. 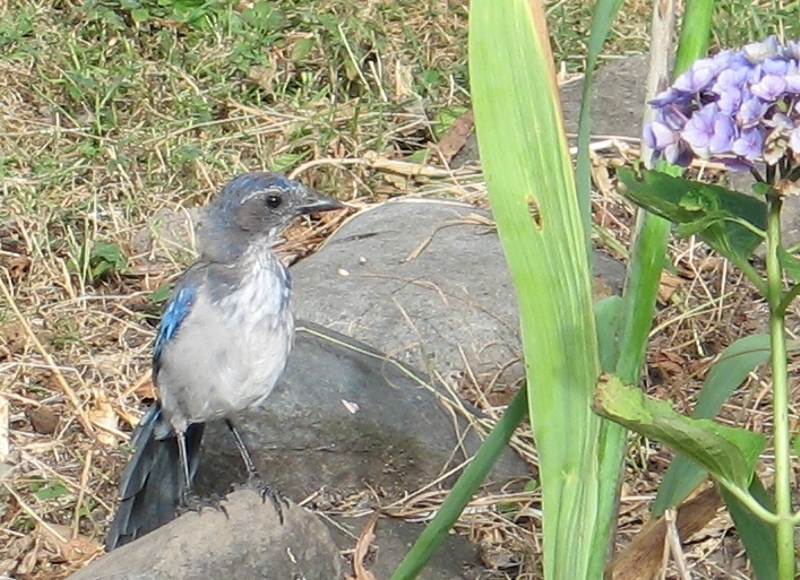 Later, I was having a short walk around the neighborhood, and more raucous scrub jays vied for my attention. But I was on the phone. Finally, around 4:00, I plunked down on my couch. Hadn't even opened the computer yet when Whump! A scrub jay landed on the planter box outside my living room window; pecked at the glass, and beat its wings against it, looking right at me. Okay, okay, I get it, already! A little googling informs me that jays as totems teach about resourcefulness, talents still to be developed, fearlessness, adaptability and least-effort survival. And they bring warnings about dilletantism, a great failing of mine (see my tag cloud to get a visual). Strangely, jays in real life are known to gang up on owls and hawks--both totems of mine. Directional shift, perhaps? So while all that ferments, I'm making my own kombucha (a weirdly addictive and wonderful drink made by fermenting sweet black tea into a sort of vinegar). 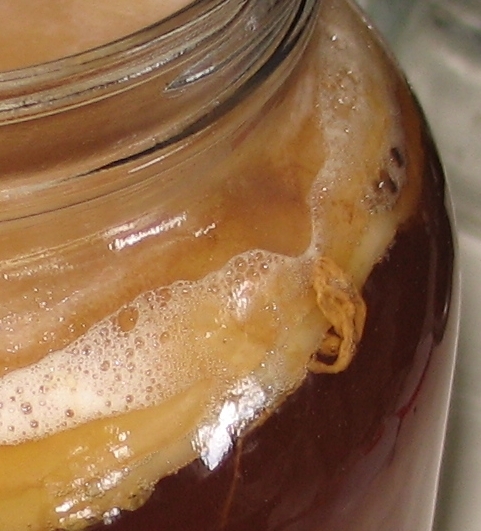 That's a SCOBY on top: a Symbiotic Colony Of Bacteria and Yeast, a.k.a. a kombucha mushroom. You get one from someone who has one, and when you make kombucha, the SCOBY sort of...parthenogenesizes and makes a baby. See? It has tiny alien arms. It's alive! Anyway, my kombucha is fermenting happily away and should be ready to drink in a week or two. I'm still trying to figure out the message from the scrub jays. So many wonderful things about this post. Thanks for sharing. In flour we trust, yeast above all else. Oh, hello! Haven't seen you in a while. I'm becoming so interested in yeast. I had no idea how profoundly we interact with it in everyday life. Oh, and I made yogurt today too. Just ate some--delicious! I like the birdies, yes, and they seem to like me. The crow at Joshua Tree was one of those indelible life moments. I should have paid more attention. The scrub jays are as raucous as all jays and crows. I was interested to learn today that the term "jay" descends from "gaea," and that part of the totemic meaning they carry is an earth-sky connection, with their blue backs and their white or gray bellies. Mister scrub jay reminds me of the "fellow" you described to me as your messenger in the Gorge. A regular working kind of guy in denim and well worn wool shirt, nothing fancy. An addition to your regular messengers but very determined to get your attention. I did not see that, and it's really helpful. I couldn't quite make the message fit (I was trying not to be in denial about the dilletantism...), but nothing about the jay totem really pinged. This does. Hee, the jay really wasn't going to be subtle anymore, was it? They are very cheeky little critters, that's for sure! I'm not a mushroom fan, so that drink made me gag a little. Hee. But it sounds kind of neat. Heh. The "mushroom" is jut the yeast starter that gets the ferment going. It comes off the top and goes into the fridge for re-use. The kombucha drink itself is a slightly sweet, slightly acidic, mildly fizzy kind of tea-soft-drink that you can flavor with lemon or ginger or fruit juice. Nothing mushroomy about it. It's quite nice. Especially compared to mushroom juice.